Beginning with a beautiful close-up of a “big” ladybug, this book artfully depicts the concept of scale. The book zooms out from the bug, to a flower, to a cow, all the way to an expansive spread of sky. Then Henry Cole masterfully zooms back in from that sky, to a tree, to a house, to a window, all the way to the end where an adorable dog is taking a “little” nap. In this ideal introduction to the concept of scale, young readers will love the lush illustrations of the animals, objects, and scenery of a farm, and they’ll delight in seeing how something “big” can suddenly seem “little” with the turn of a page! A bug may look huge to itself and other bugs. A leaf may seem big among other leaves. When you put the two objects next to each other, one will look bigger in comparison to the other. Cole has taken this idea of scale and turned it into a fascinating story that will delight kids and enthrall parents and teachers looking to teach the concept to young children. The lush paintings capture the beauty of the natural world while also showing simple comparisons. The spare text is perfectly used throughout, highlighting the unique qualities of the things that surround us. 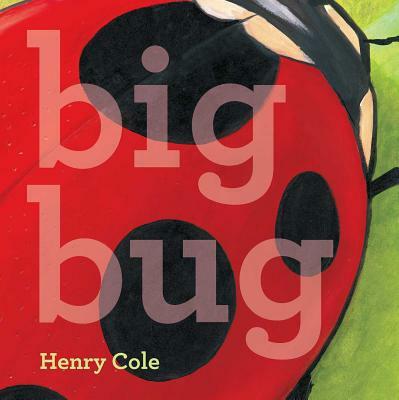 Cole starts off with a single ladybug and escalates to the vast bright blue sky before bringing the reader back down to the smaller level of a single ladybug crawling on a napping dog’s nose. The concept of scale is brilliantly depicted on the title page (where tiny ladybugs crawl over the title of the book in large font) as well as the endpapers. The different font sizes further highlight the use of scale in his breathtaking illustrations. Big Bug is a unique reading experience with broad appeal. In Cole’s latest picture book, an object can be seen as big or little depending on context. The words “Big bug” appear on a double-page spread almost filled with a picture of a ladybug. The next spread, illustrating “Little bug / Big leaf,” shows a smaller picture of the same ladybug on a large leaf. Each turn of the page takes the viewer farther away. The leaf is little compared with a nearby flower, but the flower is little next to a dog, which is dwarfed by a cow. After the “big” object pictured is the sky, the comparison vector shifts, and everything named is smaller than its predecessor. Well matched with the concept, the mixedmedia illustrations are simple and effective. Cole makes good use of changing perspectives in the skillfully composed paintings of rural scenes. Children will enjoy picking out the objects that appear in several illustrations, as they diminish or increase in size from page to page. An attractive addition to picture-book collections.